In case you’re looking to boost your ghoulish inspiration, I rounded up a quick compilation of six spook-worthy projects and spaces that will prep you for this weekend’s festivities. 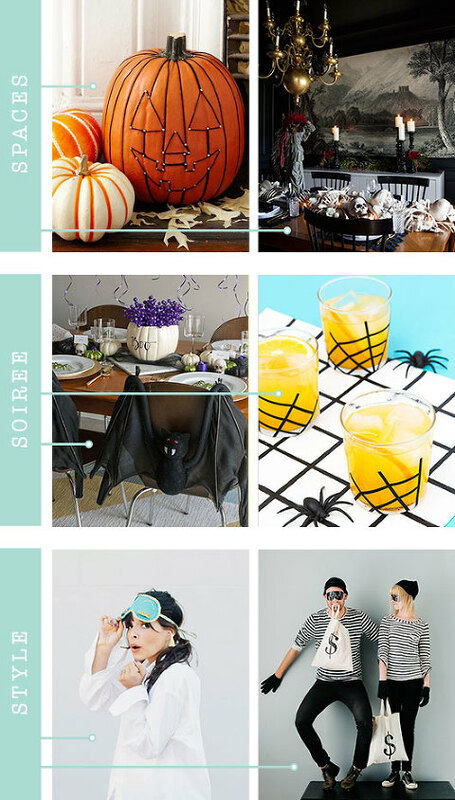 Whether you’re looking for last-minute costume ideas, Halloween cocktail recipes, or decorative pumpkin designs, these folks and creative brands have got you covered. It’s also pretty fun to look back on my Halloween Style Challenge from last year in partnership with The Home Depot—in case you’re new to Dream Green DIY, or happened to miss it when it went live last October, click back here for even more inspiration. Do you have Halloween projects or ideas of your own? Please do share them in the comments section. And before I head out a little early for the holiday weekend, just a friendly reminder that today is the last day to enter to win the $50 Snapfish shopping spree—contest details this way. Have a safe and spooky Halloween holiday, everyone! Are you looking for a plethora of impeccably styled, totally livable DIY projects to try on your next free evening or weekend? Then you have got to check out Molly’s blog, Almost Makes Perfect. Everything this creative churns out is beautifully brilliant, and I’m not just saying that. From simple crafts to real life advice on living and designing an intentionally planned home, Molly shares it all. Molly and I actually both coincidentally just embarked on that harrowing life journey known as packing and moving a household, so I feel her pain. It’s tough to feel like you’re living between homes, but she’s pulling through like a champ (in case you’re new to her blog and are in the midst of your own move, make sure to check out this post about how to move smarter). Above you’ll find six of my favorite projects from Almost Makes Perfect, but if you’re anything like me, these are just the tip of the ice berg. Mentally prepare yourself to get lost in creative inspiration, and then click here! I’ve been following along with Kim and Scott’s adventures through their blog, Yellow Brick Home, for just about as long as I’ve known what the word “blog” meant. Their seemingly unending energy is motivation enough to get just about any of our own weekend projects off the ground, and Kim’s stellar photography is pretty much the comparison point that I tend to weigh everything else against. The fact that they, too, are a family of five (two humans and four pets) leads me to believe that we’d be fast real-life friends if only our lives weren’t separated by three or four state’s worth of miles. Instead, I’ll just settle for virtual check-ins via YBH. Here are six of my favorite Vargo-made projects spanning the categories of home, parties and closet worthy creations. Which are your favorites? Spaces + Soirée + Style // Homey Oh My! UPDATE: Apologies for the radio silence guys and for the lack of blogging, but a pretty key piece to our pending move next week is still missing and I’m incredibly on edge. I just don’t have the will to blog (or basically function) until I know what’s going to happen. No matter what, I will be back with a new blog post on Wednesday. Until then, your happy thoughts and patience are most appreciated. 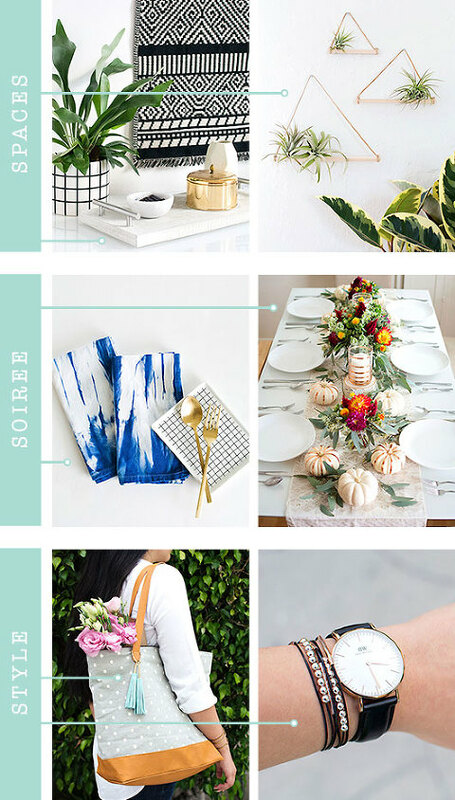 I am just loving the extra excuse to brag on my favorite bloggers with this new format of my Spaces + Soirée + Style series. What do you think? Should I keep it going into October? I think I have to, if for no other reason than I have way too many favorites not to. 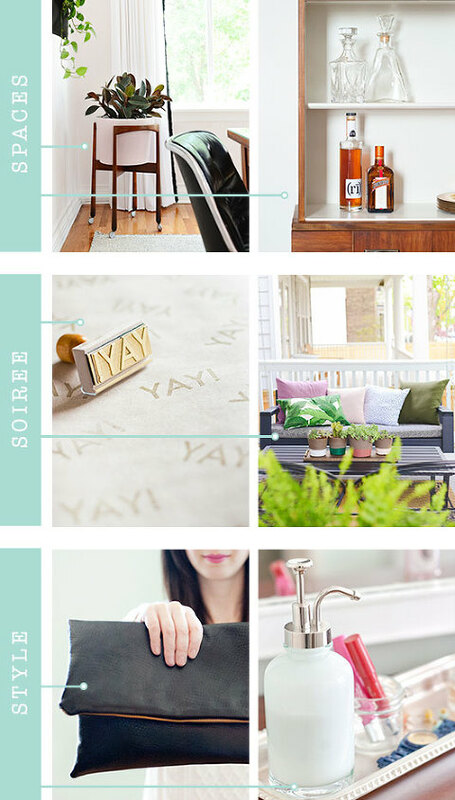 Today, I’m sharing a peek into the perfectly branded space that my friend Amy has created with her blog, Homey Oh My! 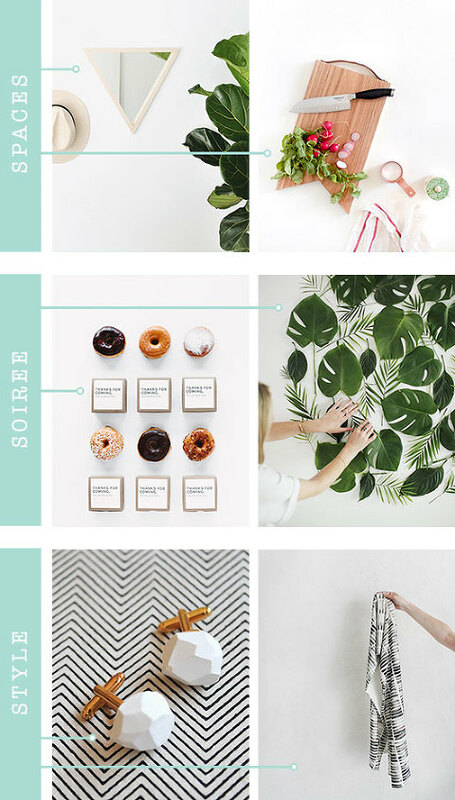 This incredibly talented crafter/stylist extraordinaire continually inspires me to embrace a clean-lined, classic lifestyle, and these six projects are the ones I can’t wait to try out in our new house. Are you already a big fan of Amy? Which is your favorite Homey Oh My! project? P.S. I will be taking off a day early for the weekend to focus my energies on packing up the house. We have most of the odds and ends put away in cardboard and bubble wrap, but there always seems to be a lingering shelf or drawer that needs to be tucked away. Not to mention, I have about 8,000 nail holes to patch and paint…Please, oh please, send your happy vibes our way! I’ll be forever grateful. As a lover of bold color and personality-packed props, I am absolutely smitten with PROPER the blog. Lexy is a master of sweet styling, and she always—without fail—has something fabulous and clever to share on her blog. From whimsical party projects (I’m in love with those pink and orange pom pom trimmed dinner napkins above!) to a smart set of paper brooches, this crafter is a pro at thinking outside the box. In case you’re looking for a little bit of extra creative inspiration, I implore you to hop over to the PROPER archives, where you’ll find a plethora of simple-to-recreate projects just waiting for a quiet afternoon at home with your own set of craft supplies. Time for a brand new installment of my Spaces + Soirée + Style series, again, with my new format profiling one of my favorite bloggers. Today, it’s all about Rachel Mae Smith of The Crafted Life. This gal is something super special! Her talent for crafting and all things DIY is undeniable, and her effervescent personality is one that I love interacting with, even from afar (our in-person interactions are limited to only a handful of moments!). These six projects are some of my top picks from her site as of late, and run the gamete from home décor to party pieces and style savvy fashion tutorials. Do you have a personal favorite from this batch? Mine might just be that over-the-top fabulous tissue box. Or her super cool hair color. Snag your behind the scenes peek of The Crafted Life, by following along with Rachel on Instagram, too! Today, I thought I’d mix things up with my running Spaces + Soirée + Style series. All throughout the month of September, I’ll be profiling some of my favorite bloggers, calling out six of their most stellar projects as they relate back to the three categories in this column: home, parties, and fashion. Although it was super tough to narrow down to just four bloggers since I’m a big, big fan of so many (you included if you’re a blogger yourself! ), I’m excited to give the love back to these four from now till the end of September. Who knows! If you guys love the new format, maybe it will become a running tradition. To kick things off, I’m bragging on Sarah’s blog, Sarah Hearts. Click through to her archives, and be prepared to find inspiration with every single click. P.S. It’s your very last chance to snag a spot at this season’s Hello Sessions workshop in Portland on October 9th! Joy and Melissa are closing ticket sales on September 15th at midnight so that they can finalize their head count for the space, and trust me when I saw that you aren’t going to want to miss out. Get 10% off your ticket with code “LASTCHANCE” at check out. P.P.S. Don’t forget to enter the $100 Pinhole Press giveaway! Contest details this way. Although hand-lettered designs have been all the rage the last couple of years, I think it’s worth mentioning that calligraphy has really been around for as long as art itself has existed! Calligraphy has been a particular part of my life because my mom has done it for the local church and for friends and family ever since I can remember—things like wedding certificates and invitations. She has the loveliest handwriting, and while today’s styles are a bit more free-handed and flowing, that doesn’t change the nostalgia factor for me—calligraphy is just plain beautiful. I’ve had the chance to connect with so many modern calligraphers in my time blogging, and many of them are represented above in today’s Spaces + Soirée + Style collage. I’ve met in person with Kathleen (of Leen Jean Studios), Alyssa (of Parris Chic Boutique) and Laura Hooper, and all have been such inspirations for me. Despite the fact that I have, not one, but two calligraphy classes under my belt, I think I’ve still got a long way to go in learning the art myself. But my fingers and toes are crossed. It runs in my blood after all. Have you tried to learn? One of my favorite things about our family tradition of going to the beach in the beginning of the season is that we usually get to hit the sand way before anyone else does. I get a jumpstart on my tan and have the opportunity to deeply breathe that blissful sea salted air right at the start of summer. But there’s, of course, a drawback to this tradition, too. Mainly, the fact that when I get home from the coast, all of my friends start jet setting off to the tropics, and scrolling through my Instagram feed ends up leaving me pea-green with envy. So, ultimately, I do what any other starved-for-the-sea gal would do: I turn to Pinterest to feed my need. Above you’ll find just a few of the beachy photos, projects and spaces that are keeping me inspired here in mountainous central Virginia. And to all of you headed to the ocean this week…pack me in your suitcase, wouldja? Topping the trends as of late is quite an unlikely character: the prickly, pokey cactus. If you think about it, this plant should be the very last thing that we creatives go “ga-ga” over, but cacti have slowly but surely stolen our hearts, one spine at a time. I don’t mind admitting that I, myself, am quite taken with the funny silhouette and pretty green hue of this desert native, and happily, I’m not the only one. Click those links above for all sorts of pin-worthy projects that feed into your own infatuation with cacti, whether you’re looking to add it to your home, party or wardrobe. Oh, and speaking of, my pal Rachel posted her own cactus-centered round up yesterday over on her blog, The Crafted Life! If you’re looking for even more inspiration, hop over to her site now, and be prepared to soak up all the needled projects you could ever hope for.